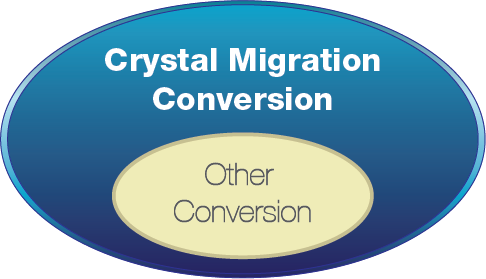 Crystal Migration Services provides leading-edge conversion services since 2011. We can convert any version and any complicated Crystal Reports to SSRS 2005, 2008, 2012 and 2016. Our conversion accuracy and capability set us apart in the industry. Our automatic solution has clone like accuracy, and can converts lots of features such as crosstab that our competitors have to do by hand. Any other automatic conversion solutions can only cover at most 75% of what we can do. 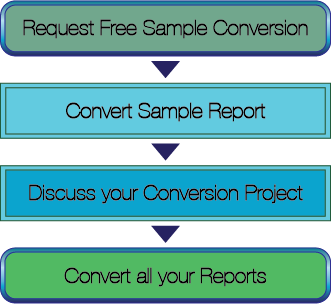 Please contact us to save you time, effort, and money in your report conversion project. Send us one of your Crystal Reports for us to convert to SSRS now to see the results for yourself. Crystal Migration Services has three distinct advantages that no one in the industry can offer. Reports can be automatically converted with no manual invention. Over 98% of accuracy is achieved and rest is due to lack of features in SSRS or Crystal. We are the only report migration solution provider that can automatically convert advanced features such as cross-tab, specified order grouping, section coloring, field highlighting, complicated formulas, running totals, etc. We are proudly offering our clients lowest cost in the market. Our operation cost per report has been significantly reduced due to accumulated client base in years and superior technology we developed along the way. We would like our clients to benefit from our success. Above all, your complete satisfaction is what we are working for. Auto conversion only takes seconds to minutes to work. If you worry about the features that are lack in SSRS or Crystal, our experienced consultants will help you on this in an efficient way simply because they have seen so many and worked out so many. Your time and effort will be saved with ease. We can automatically convert almost anything from Crystal to SSRS except a few features supported in Crystal, but not in SSRS. The accuracy and quality of these results can significantly reduce the time and effort doing tweaks or fixing issues. Individual report refinement is the customers responsibility, but consulting services are optional if you want to speed up your conversion project. Just send us all your Crystal Reports, give Crystal Migration Services access to the necessary data, and your instructions on how we should test the conversion. Then sit back and relax while we do all the work for you to convert your reports to SSRS. Please contact us for details. We have experts for both Crystal and SSRS and in our many years of experience converting ten of thousands of reports we can help bridge any gaps you might have to efficiently migrate your reports. Any Questions? - We can help! No one is even close to our conversion quality. We can automatically convert lots of advanced featues while others just cannot. How to Use our Conversion? We do automatic conversion, consulting and full conversion. Your report will be kept confidential. Fill in the following form and upload a Crystal Report for sample conversion. Or click "Try Now" and upload your sample report to our server.